Cardamine diphylla. 2001 Eleanor Saulys.ct-botanical-soiety.org.. (Accessed 5/2014). Cardamine diphylla is a perennial, spring ephemeral herb; stems to 40 cm, colonial from rhizome. Leaves alternate; basal leaves 3-parted; central leaflet broadly egg-shaped to 8 cm long, 6.5 cm cm wide, margin irregularly toothed, stem leaves 2, more or less opposite, similar to basal, central leaflet to 10 cm long, 4.5 cm wide. Leaves last 10 weeks (Hicks and Chabot 1985). Flowers white, petals 4, to 1.7 cm long, sepals to 0.8 cm, blooming April. Fruit dry, capsule linear, to 4 cm long. 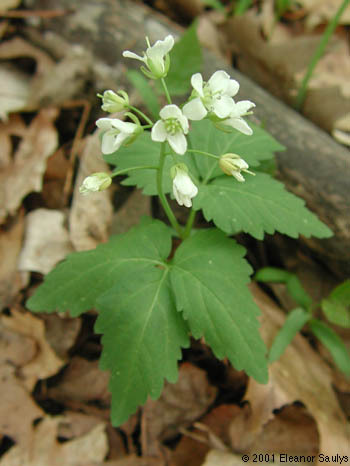 Habitat: Moist, undisturbed forest understory. Notes: Requires at least 0.4% sunlight in order to survive(compensation point), but cannot use more than 3.8% full sunlight (saturation point) (Hicks and Chabot 1985). (Hicks and Chabot 1985). Cardamine species are host to the larvae of the falcate orangetip butterfly, Anthocharis midea (Pieridae).